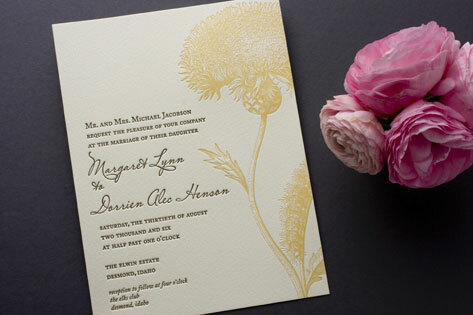 A lovely, intricate floral illustration embellishes the right half of this letterpress wedding invite, which is perfect for a spring, summer, or garden wedding. An elegant script font stands out beautifully against the cream background of the invitation, and intricate illustrations tie together all of the pieces of this stunning wedding invitation suite. Available in buttercream/chocolate (shown), lavender/burgundy, and sage/olive.